Cone centres are designed to suit the reverse cycle systems. 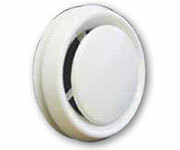 Cone centres allow adjustable control of the airflow by moving the centre up or down. This is achieved by a twisting technique. Clockwise decreases and shallows the airflow while anti-clockwise increases and deepens the airflow.